Wedding cupcakes are our specialty! Owner Erica Elia baked her own wedding cupcakes, and she and our dedicated staff give the utmost personal attention to our wedding and event clients. Even though we cater 8-10 weddings per weekend in the summer, don’t be surprised if Erica and our wedding consultants remember you when you pop in months later or visit us on your anniversary for a celebratory cupcake. We started out as a Milwaukee wedding cupcake caterer before we opened our retail bakery, so we have experience catering thousands of weddings, corporate events, parties, and more. 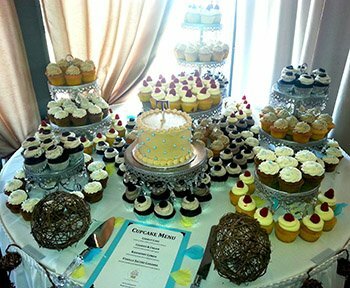 Our largest single order was 6500 cupcakes for the American Cancer Society breast cancer walk, so let that be an example of what we are capable of, and know that we treat each of our wedding clients with the same high level of care. Every component of your special day should be perfect, and we strongly believe that we can provide the one element your guests will be talking about long after your big day! In addition to wedding cupcakes, we also offer tiered wedding cakes, anniversary cakes, grooms cakes, and more. Our talented cake decorators can create a beautiful cake to compliment your wedding cupcake display! 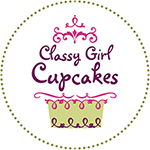 Here at Classy Girl Cupcakes, we bake our cakes fresh 100% from scratch using natural ingredients. It is our philosophy and design aesthetic to use only our homemade buttercream, and we choose not to work with fondant, gum paste, or other artificial frosting preparations. It is also important that your wedding cupcakes fit in your budget. We keep our pricing competitive by having highly trained bakers and decorators who are experts at executing our recipes as efficiently as possible. Because we focus on using natural ingredients rather than creating inedible sculptures, we have found the ideal balance of quality, service, and price that makes us Milwaukee’s premier wedding cupcake caterer. Cupcake catering pricing is noted below each flavor on our website, and we never raise our prices when we hear the word “wedding”! All wedding consultations are held at our Cathedral Square bakery location in downtown Milwaukee. Please note we do not offer wedding consultations at our Brookfield Square bakery location at this time. Our schedule does book far in advance, so we encourage you to come in for a free consultation appointment as soon as you decide to consider cupcakes at your event. It’s never too early! The major advantage of booking early is a 10% discount on your entire order if you’re able to pay in full at your consultation, your order is $500+, and is more than 90 days away (download our Event Contract below for specific terms of the offer). Also, we rent our wedding cupcake displays in the order of booking, so you’re more likely to get your first choice if you book early. We can accommodate a larger number of weddings per weekend than any of our competitors, while baking everything you order fresh 100% from scratch. So if you happen to be reading this mere weeks before your wedding, don’t get discouraged, call us! We’ve been lifesavers for many last minute orders, and we nearly always find a way to make it work. We offer free consultation appointments 6 days a week for weddings and catered events purchasing desserts for 50+ guests. If you would like to try some samples at your meeting, we offer 4 cupcakes free of charge if you choose from the 25+ flavors we will have in stock on the day you come in. We don’t make all the flavors on our website every day, so if there are any particular flavors you want to request ahead of time, there is a $6 charge per flavor for us to bake or reserve them for you. Our event contract can be downloaded below, or we can provide a copy by e-mail or in person. Once you are sure you would like to book with us, please fill out the lefthand column of the first page of the contract, sign the last page, and mail or bring it along with a $100 deposit to reserve your wedding date. The deposit is non-refundable, and will be deducted from your final order, and the balance is due at least 10 days before your wedding. Alternatively, we offer a 10% discount on your entire order if you’re able to pay in full at your consultation, your order is $500+, and is more than 90 days away (download our Event Contract below for specific terms of the offer). We generally suggest ordering 1.5-2 standard size cake cupcakes or cheesecake cupcakes, or 3-4 mini cupcakes per person, and limiting the flavor selection to 2-4 flavors. The more flavors you choose, the more your guests will be tempted to try one of each, and you want to make sure you don’t run out. If you want to stick close to one cupcake per person, we suggest only ordering one flavor in standard size. Please contact us today to set up a meeting. We look forward to hearing from you! Please visit the FAQ – Weddings webpage for more wedding related information.